When you need to remove sediment from a lagoon and standard methods of agitation are not effective, lagoon dredging is the preferred approach. 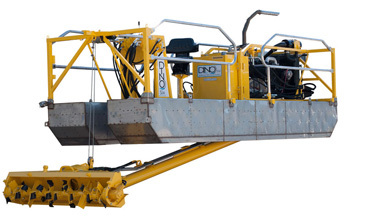 Lagoon dredging involves using a dredging system, like the Dino Six dredge, containing a powerful pump to excavate the sediment. The dredging system goes into the lagoon and uses a high-torque direct-drive cutter head to release the sediment and move it to the dredge pump, allowing you to easily remove the sediment from the lagoon. A lagoon filled with sediment is unattractive due to the level of muck and debris floating around in it. It also usually smells terrible. Removing the sediment can deepen and widen your lagoon while also improving its look and odor. While agitation can compact some sediment in a lagoon, this will not work on lagoons that have allowed sediment and sludge to sit for a long time and become dense and adhered to the lagoon bottom. Dredging is also an effective way to clear sediment in shallow industrial lagoons in the wastewater lagoon industry, where you may be trying to conserve return water. We have worked tirelessly to develop the best possible lagoon dredging equipment, and the result is superior dredging barges like the Dino6 dredge. The Dino6 is ideal for removing unwanted sediment from your lagoon. It is small enough to easily maneuver through small lagoons, even though it is more durable than much heavier and more expensive machines. At less than four thousand pounds, the Dino6 can excavate areas of your lagoon that a larger hydraulic dredge will not be able to reach. 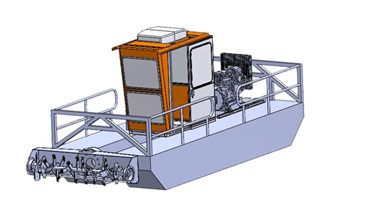 With 65 horsepower, a working depth of anywhere from 14 inches to 13 feet and a 1500 GPM flow, this barge has all the pumping power and depth capacity to effectively clear accumulated sludge, sediment, trash and debris from your lagoon. The pump itself is an extremely abrasion-resistant hydraulic submersible dredge pump that is quite durable. 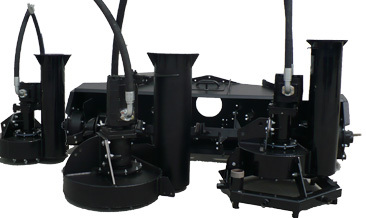 This is the dredging system you need for your lagoon. When it comes to sediment removal from lagoons, Geoform International is the obvious choice. We have a range of small-scale sediment removal systems to meet all your lagoon, pond or river dredging needs. To learn more about the Dino6 or our other dredging machines, contact us online or call us at 913-782-1166 today.